Peanut, a mixed-breed dog in our extended family, really isn't the size of a peanut. He's more like the size of black lab with a big personality to match. He has an "affection" for stuffed animals, particularly the stuffing part. One of my daughter's stuffed rabbits, a yellow one dressed in a satin ballerina dress, almost became a "dirty bow wow." You know, a dog toy full of slobber, a slightly chewed, or in Peanut's case, pulled to pieces doggie play thing. Luckily we managed to save yellow ballerina bunny. Other stuffed animals haven't been quite so lucky. Dirty Bow Wow: A Tribute to Dogs and the Objects of Their Affection showcases 52 canine pets posed with their beloved play toys. Authors Cheryl and Jeffery Katz compiled this delightful book of "dirty bow wows" and dogs. Each page spread features an adorable portrait by photographers Hornick/Rivlin who performed miracles in capturing expression-filled dogs with their precious toys. 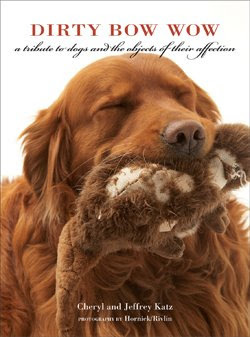 A short, often humorous blurb accompanies each photo and brings insight to each dog's life. All sorts of dogs, the adopted strays and rescue dogs to the most highly pampered pedigrees, are gathered inside the glossy pages. Man's best friend has never looked prouder or more adorable. A quick and enjoyable coffee-table worthy read, all dog lovers will find something to love when perusing Dirty Bow Wow. In my household, lots of books fall into my hands and my hands alone. However, this book managed to become a family favorite. My preschool-aged daughter immediately fell for the Toy Poodle named Annie Goodman modeling her beloved chic Pink Purse toy. My husband, the discerning reader (so discerning he hardly ever picks up a book) read Dirty Bow Wow cover to cover and remarked on a number of dogs. Puggle Lucy nose-to-nose with her stuffed, earless Doggie won him over. She's pictured in the toy drive photo below. As a book reviewer, I am probably one of the only people who read the title page. I noticed a rather hidden photo of a Bernese Mountain Dog named Hogan displayed opposite on the frontispiece. Somehow this shy Hogan and his Rabbit did not make mention on the contents page so he wins my vote and makes mention here. Think you could find a favorite? Bet you could. This May 2009 you can give a deserving dog a toy by participating in the Dirty Bow Wow Toy Drive. Several bookstores have signed up to host Dirty Bow Wow events and are encouraging customers to donate toys for shelter dogs. Check the bookstore list to find an event near you. Or, if you can't attend a bookstore event, consider purchasing a toy and bringing it directly to your local animal shelter during the month of May. Maybe your donated toy will become a beloved dirty bow wow. Win a copy! Ten Speed Press has kindly offered to give away (1) hardcover copy of Dirty Bow Wow to a Brimful Curiosities reader. To enter, leave a comment telling me about your favorite dog or a favorite dog's toy. • Contest ends on Monday, May 18th, 2008 at 11:59 PM CST. Thanks to Family Review Network and Ten Speed Press for this review opportunity! My dog's favorite toy was always a big long sock stuffed with other socks and tied off at the end. He liked to play tug-o-war with it! Our dogs favorite toy is any of my son's stuffed animals that she can sneak off with! I subscribe to your feed and also follow you on twitter! Though I no longer have dogs, my sister has 3 Beagles and getting to know that breed because of them has been a lot of fun. My father and mother had a dog that would go into the garden and get a small cucumber in his mouth, throw it up in the air, and catch it again. He would do this over and over again with the cucumber. Wish we could have caught that on video. My dog Kouga's favorite toy is a stuffed caveman who grunts when he bites it. He also likes his Kong. We don't have a dog, but my grandma has a dachshund pup that goes crazy over a stuffed sock toy. My son loves playing with her. Kona, my german shorthaired pointer of fifteen years still loves to chase after her frisbee. As a youngster, she would run for ages after it but now a days she has slowed down a great deal, but still will run a little way and continue to try to catch it. I don't think she will ever stop loving that frisbee. My favorite kind of dog is the toy poodle. I used to own two black labs named Muncie and Tremic but had to give them up to a foster home when I moved to a home that doesn't allow pets. I love Dogs, Big, Little doesn't matter. I share my home with one dog now. He is a 4 year old Cairn/Yorkie Terrier. He is a sweet little guy. He has his favorite toys and loves for the kiddos to grab it and take off running. That is how he gets his exercise chasing them to get it back. They tell him to sit, toss the toy and he goes and gets it brings it back begging for more. I sometimes think he honestly believes he is either a little boy, or a cat... Yep he acts like a cat, lays on the back of sofas, curls up in the recliner. Thank goodness for our pets. Thanks for the chance at the giveaway. This book looks absolutely wonderful. I've only had one dog in my life, that was our mini-daschund, Fritz. It seemed strange having a dog named after an uncle, but hey, who am I to complain. Do you remember that old game Cat's Eye? It was a game with marbles and you had to be the first one to fill up your cat tray--if I remember right. Well, Fritz one day decided to swallow one of those marbles and no one in the entire house believed me when I told them about it. A trip to the vet for a severe bout of constipation and some medicine that finally relieved the problem, vindicated me and I never let the family forget it. LOL! I don't have a favorite dog - We currently have an Aussie Mix and a Golden Retriever - Both are great in their own ways. One is mellow and a little "slow", the other is a fast girl and smart as a whip. I am lucky to have them both! I have one dog, a Golden Retriever, and his favorite toy is his retrieving dummy. He tries to carry it out whenever he goes outside!